Os grid reference: SJ 3490 8221. 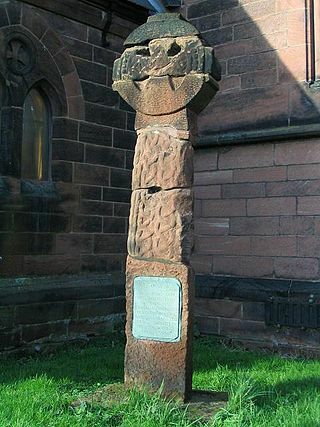 On Church Lane in Bromborough, Wirrral, stands the 10th century St Barnabas Churchyard Cross, where at the south-side beside the church porch stands this heavily re-constructed Anglo-Saxon wheel-head cross. There are apparently some other carved stones, possibly of Saxon origin, in the garden of the nearby parsonage; and in the churchyard there is an interesting 18th century sundial and, close-by stands the 19th century market cross. St Barnabas’ church is located in the centre of the village on Church Lane to the west of the river Mersey – at the east-side of the Wirral Peninsula. Birkenhead lies 3 miles to the north on the A41 road while Ellesmere Port is 3 miles south-east on the M53. Bromborough is thought to be one of the many contenders for the Battle of Brunanburh (937 AD), though there is ‘much’ debate about that. The first church ‘may’ have been established here in 928 or 934 AD, but there may have already been a monastery here, and then a Norman foundation which stood for several hundred years, though the present red Sandstone parish church is of 1862-4. There may have been Viking incursions into the area during the 9th and 10th centuries, which is why it is sometimes assumed the cross shows some ‘tenuous signs’ of Scandinavian influence, though it is generally regarded as being Saxon carving. Early chronicles suggest that the first church, and quite possibly [the monastery] were founded by Aelfthryth, or Ethelfleda, Lady of the Mercians, sometime around 912 AD. Lady Ethelfleda was the daughter of King Alfred the Great. The Saxon preaching cross was put together from three fragments of Saxon stones that originally resided inside the church, and was re-erected beside the porch in the churchyard in 1958. It looks to be quite a crude monument and something of a mish-mash of the three seperate carved stones ‘haphazardly put together’ that are thought to date from the 9th-10th centuries. These pieces of carved stone originally stood in the present church and, indeed in the earlier Norman foundation before that. The sculptured wheel-head is quite basic really, with only faint carvings across its middle; the only other bit of carving is a long panel of worn interlacing on the shaft, below which a plaque* is attached recalling its history and which, rather sadly spoils the monument. The two parts of the wheel-head above and below the middle (carved) section look to be of a later date, possibly the 12th-16th century? Also of interest in the churchyard is a 18th century sundial. This may originally have been part of the market cross. It stands upon two square-shaped steps on a base, and has a thin tapering shaft with a square top and dial. The date is recorded as being 1730. In front of the churchyard stands the very tall market cross with square-shaped pillar standing on an eight-stepped plinth, supporting a fine ornamental top. Author Derek Bryce in his book ‘Symbolism Of The Celtic Cross’ says of this monument: “The cross at Bromboro in Cheshire stands on a stepped pyramid base, the steps of which are clearly not intended for treading…..the cross is surmounted by a sphere and sundial, which have since been replaced by a cross ecclesiastical.” The steps (plinth) of the cross are clearly medieval, maybe 13th century, the rest is from 1874. Categories: Ancient Crosses | Tags: St Barnabas Churchyard Cross at Bromborough in Cheshire | Permalink. Terry, it all seems ok to me. The reason for the font and larger writing, is that it should be easier to read, because people do not like very tiny writing. Terry, its difficult to please everybody, but sorry about that problem.